It’s estimated that as many as 25 million Americans have a thyroid problem, and half of them have no idea that they do. 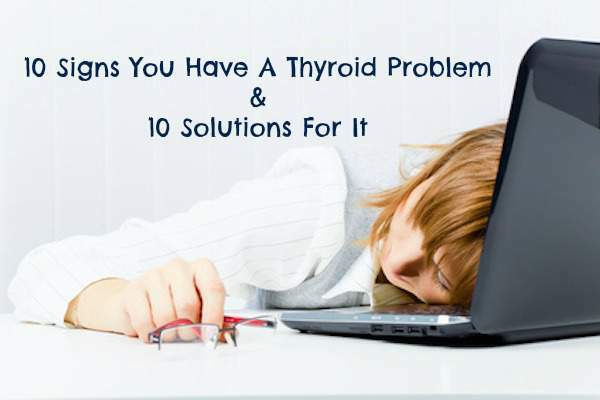 Hypothyroidism, or an under-active thyroid, accounts for 90% of all thyroid imbalances. To complicate matters, T3 also gets converted into either Free T3 (FT3) or Reverse T3 (RT3). It’s the Free T3 that really matters in all of this, since it’s the only hormone that can attach to a receptor and cause your metabolism to rise, keep you warm, keep your bowels moving, mind working, and other hormones in check. The role of Reverse T3 is not well known, however, I do see it elevated in persons under extreme stress and those who have mercury toxicity. Most conventional doctors use the ‘normal’ lab reference range as their guide only. Rather than listening to their patients’ symptoms, they use ‘optimal’ lab values and temperature as their guide. I check the below panel on each of my patients. Make sure your doctor does the same for you. You can also order your own thyroid lab tests. 1. Make sure you are taking a high quality multivitamin with Iodine, Zinc, Selenium, Vitamin D, and B vitamins. 2. Go gluten-free! If you have Hashimoto’s, try going completely grain and legume free. 3. Deal with your stress and support your adrenal glands. The adrenal glands and thyroid work hand and hand. I recommend restorative yoga and adaptogenic herbs such as this blend by Pure Encapsulations, which support the adrenal glands in coping with stress. 4. Get 8 to 10 hours of sleep a night. 5. Have a biological dentist safely remove any amalgam fillings you may have. 6. Watch your intake of raw goitrogens. There is a bit of a debate surrounding this. 7. Get fluoride, bromide and chlorine out of your diet and environment. 8. Heal your gut. A properly functioning digestive system (gut) is critical to good health. 9. Find a functional medicine doctor in your area and have them run the above laboratory test and work with you to find your root cause of the thyroid imbalance. I never want anyone to go through what I had to go through, so it is my mission to educate as many as I can that there are other healthier ways to recover from thyroid disease. I’ve seen incredible health changes with my patients in my clinic Austin UltraHealth. My book The Thyroid Connection: Why You Feel Tired, Brain-Fogged, and Overweight — and How to Get Your Life Back became a New York Times bestseller the first week! Hi I need help for my mother.she is coughing lot side at least 15 years.we do lot of test but they couldn find anything.last year we went to my cushion house USA.she work in laboratory for blood test.she took blood sample and yet nlodd.they goons my mother has thyroid problem.the blood test shows thyroid way high then normal.then we come back and did blood test with our doctor.doctor told us thyroid is normal.we need helt.is there any other way to treat thyroid.please help. I’ve had the strangest symptoms lately with the main one being dizziness and an off balance feeling. I’m only 19 and am having a ton of issues. I’m gonna go get tested for multiple things to see how I can heal myself. Remember that the big picture should be looked at as a whole. There is often an underlying problem that causes all of these issues. Definitely research ways to heal your gut, mind, adrenal glands, and nervous system because they often are the root of issues such as thyroid dysfunction. When you think about it everything these days is poisonous to our bodies. Just be careful and think about everything that is going into/on your body. I wish peace and healing to you all and that you get to feel yourselves again someday. How do I seek the healing of my creator? Pls help me. All of you sound like you should get tested for lyme disease and other coinfections just to be sure. Acupuncture is witchcraft, while it can seem to produce results it will lead to other complications. Seek the healing of your Creator- he made you. Would you take your car to your local mechanic for repair or service if he was a known carjacker or Thief? There are many good natural remedies designed to be used for of our needs also supplied by our creator- the Creator of the universe. The medical field seeks to hidIe this information and discourage it. Steer clear of acupuncture, reflexology, sacral cranial therapy, yoga etc. Also high fructose corn syrup, monosodium glutamate (MSG) highly processed foods, sugar, artificial sweeteners, food coloring Etc. I learned a lot through my family having Lyme’s and winding up contaminated with extreme amounts of heavy metal. There’s very few doctors in the country that can be trusted not to load you with drugs, same with hospitals. Thankfully I know the best Healer, also a good medical doctor & many old home remedies. Any questions contact me- thanks! Holy cryptorchids, Glenn, you stupidly invite questions but wisely answer none. Am I able to ask you some questions? I was diagnosed with Hyperthyroidism yesterday after having crazy high heart rates for about a month. I am completely freaking out! I am 35 . I don’t know what to do. I had more blood work this morning and I have made an appointment with a naturopathic doctor as well as i am going to see a n endocrinologist I am petrified about the treatment most of the reading suggest the medication in pill form fails which only leaves an option for Radioactive Iodine which ultimately leads to hypothyrodism which lead to having to take a pill for the rest of my life. My Primary care provider has let me know that the encrinologist wants to start med asap. Tx doesn sound like a solution,abatement is not the solution and neither is surgery. what to do? I feel completly lost. Hello. I am currently seeing my second endocrinologist. No one can dx me with anything. I’ve had symptoms of Grave’s, Hashimotos and probably 25 symptoms of things that is wrong with me. I think I’m getting narcolepsy now. I had to have a memory test for short and long term memory loss. Needless to say I did poorly. I sometimes contemplate suicide because I feel so very bad. I don’t go anywhere. I suffer severe migraines and other types of headaches. I need to be a guinea pig for science. My mother and sister both had hypothyroidism and autoimmune disorders. Why can’t anyone dx me with something? I feel like maybe I have that disease where you sound like a hypochondriac. Just think I went to my dr and said I think I have a vitamin difficency and hormone problems and that started the ball rolling. The only thing I don’t understand is I am never cold. I am so hot I can’t stand it. I sweat in the shower after and all day long. I have to have a fan blowing on me at all times. This all started in April 2013 I have the worse case of burning mouth syndrome. Today it is a tad bit better, but then it gets fired up again. It never goes away. Can you help me? What should I do? I have so many specialist’s it’s not funny. I’m so doctored out. There has to be someone out there that can help me. Like I said I’ll be a guinea pig. May I suggest you have them test your gallbladder. I have a very low reading of hypothyroidism and was just dx with it when I came down with IBS, and GURD. I was also placed on Prilosec. I had night sweats so bad it was completely disturbing my sleep as well as my husband’s. I had a complete hysterectomy 12 years ago, should not be having night sweats. Also I was still feeling bloated, getting heavier, tired all the time, and I had an uncomfortable feeling under ribs just below my right breast and a stabbing pain in my back between my shoulder blades. All of these can be related to your gallbladder. I am feeling so much better since I had my gallbladder removed. IBS, gas, bloating…..gone. I have lost 60 lbs by watching what I eat and work out….but it works now that my thyroid treatment started (Levothyroxin 75mcg) AND gallbladder removed. My thyroid tests since surgery indicates my thyroid numbers are even lower, so medication was reduced slightly. No SWEATING at night or ever really unless I am working out or it is warm weather. This has been a miracle for me and I can only hope it helps you. Please ask your GI doctor to give your gallbladder an ultrasound to see if you have stones…..get it removed if you do….it will only get worse. Don’t let them run you around on it, your gallbladder can make you so sick and yet overlooked. I hope you try this, best if so, good luck!! Kelly, I have been experiencing all the same things you describe right down to the burning mouth, including unfortunately, the doctors attitudes! I’m not sure how it works- but I found a really good acupuncturists who uses Traditional Chinese Medicine. It’s made a huge difference in how I feel- It’s been pretty amazing. If you can try that- just make sure you go to someone who has in depth knowledge of acupuncture & traditional Chinese medicine. Acupuncture is witchcraft, while it can seem to produce results it will lead to other complications. Seek the healing of your Creator- he made you. Would you take your car to your local mechanic for repair or service if he was a known carjacker or Thief? There are many good natural remedies designed to be used for of our needs also supplied by our creator- the Creator of the universe. The medical field seeks to hide this information and discourage it. Steer clear of acupuncture, reflexology, sacral cranial therapy, yoga etc. Also high fructose corn syrup, monosodium glutamate (MSG) highly processed foods, sugar, artificial sweeteners, food coloring Etc. I learned a lot through my family having Lyme’s and winding up contaminated with extreme amounts of heavy metal. There’s very few doctors in the country that can be trusted not to load you with drugs, same with hospitals. Thankfully I know the best Healer, also a good medical doctor & many old home remedies. Any questions contact me- thanks! where is this healer you speak of? His name is Jesus. He is the Creator of all things and able to heal all things. He is Truth. Jesus is the only true and pure source of Life. This is not a religious answer. Rather, I’m talking about the Person of Jesus Himself. Talk to Him, you’ll find Him. “Thankfully I know the best Healer, also a good medical doctor” 😂 …. Priceless!